Dienes Corporation understands that not every razor blade is the right razor blade for you to achieve the quality cut that you and your customer desire. Put Dienes’ 100 years of know how to work for you. We have many varieties of razor blades available. From three hole style to slotted or ceramic coated to solid carbide we can cover any razor slit application. 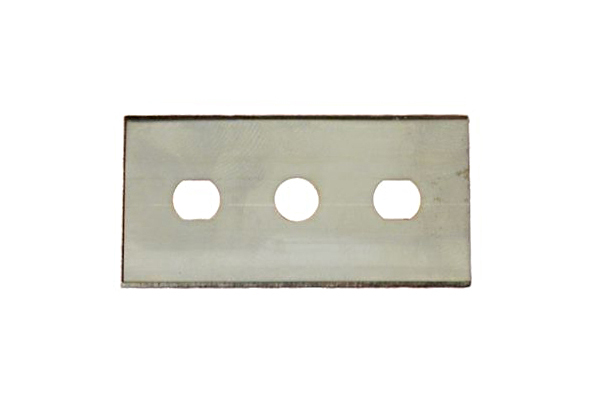 At Dienes Corporation we understand that your razor blades need to be manufactured from the highest grade steels with highly precision edges to perform consistently time and time again. Contact the experts. 02913 Ceramic Coated Razor Blades 1.69 x .875 x.008"
02927 Ceramic Coated Razor Blades 2.25 x .75 x .015"
02931 Solid Carbide Razor Blades 2.25 x .75 x .015"
655723 Titanium Coated Razor Blades 1.69 x .875 x .008"